The safety of your loved ones is always your number one concern. But when was the last time you checked your smoke detectors, or had a domestic fire drill? Call Sonic Security UK Ltd today. We can advise you on inexpensive ways to keep your family safe from the risk of fire. Your business premises will have lots of potential fire hazards. From stores of paper, to chemicals and paints, and electrical cables. If fire strikes, it can be devastating to your business. 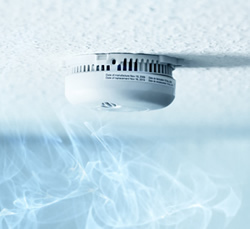 Our high quality fire alarms can literally be a life saver. Don’t take a risk with fire, phone us today. We don’t just supply and install fire alarms and fire safety systems, we can maintain and repair them too. Our experts are on hand whenever you need them. Your safety is our priority.